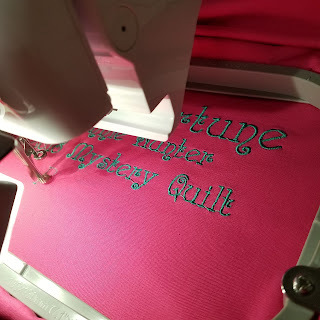 Time to share my Good Fortune Mystery Quilt progress. I decided to pull the backing fabric from my collection of fabrics, too. I was only a little surprised I found enough pieces in the right colors. 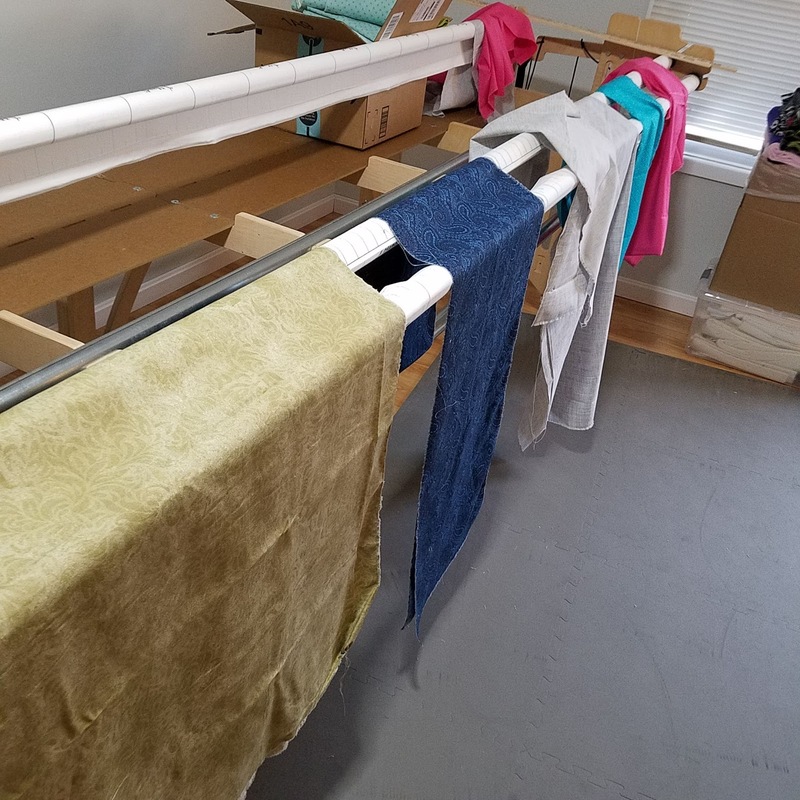 I grabbed all the coordinating colors, laid them out, measured and was fairly certain I could come up with enough backing. While I assembled the other pieces of the backing, I stitched out the label onto one section. Due to a cutting error, I needed to make the pink section a little wider. I pulled out those two leftover blocks and added them in. I think this is great! 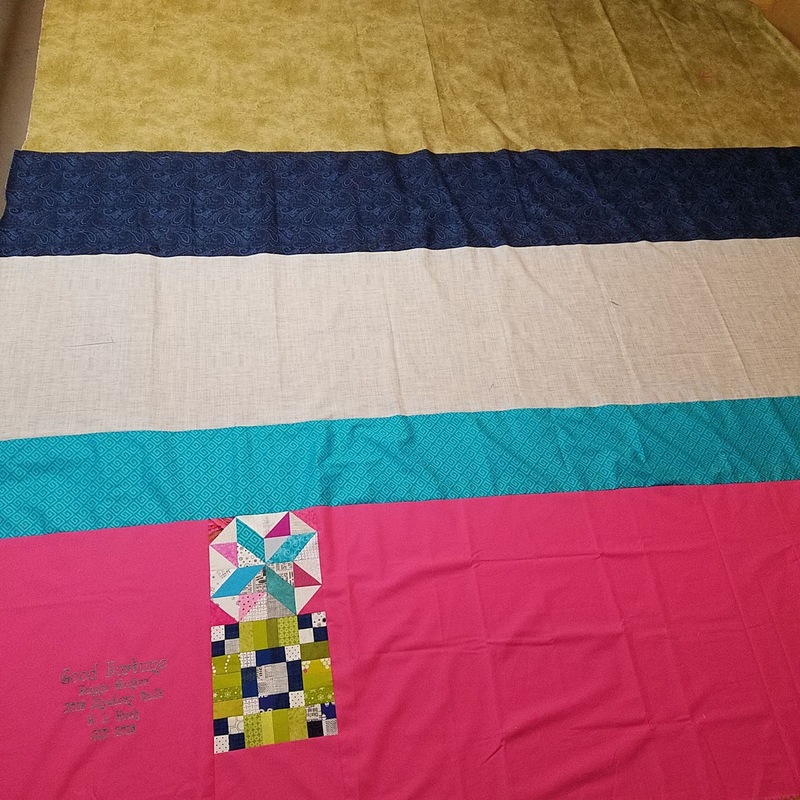 Since just about everything was closed on Sunday due to weather I loaded up the quilt with my mashed up backing and got quilting. I used a big flower design as an all-over motif. The piecing says enough without getting fancy with the quilting. It took most of the day, but it's quilting and trimmed. All that remains is binding. Maybe I'll be able to squeeze that in sometime this week. 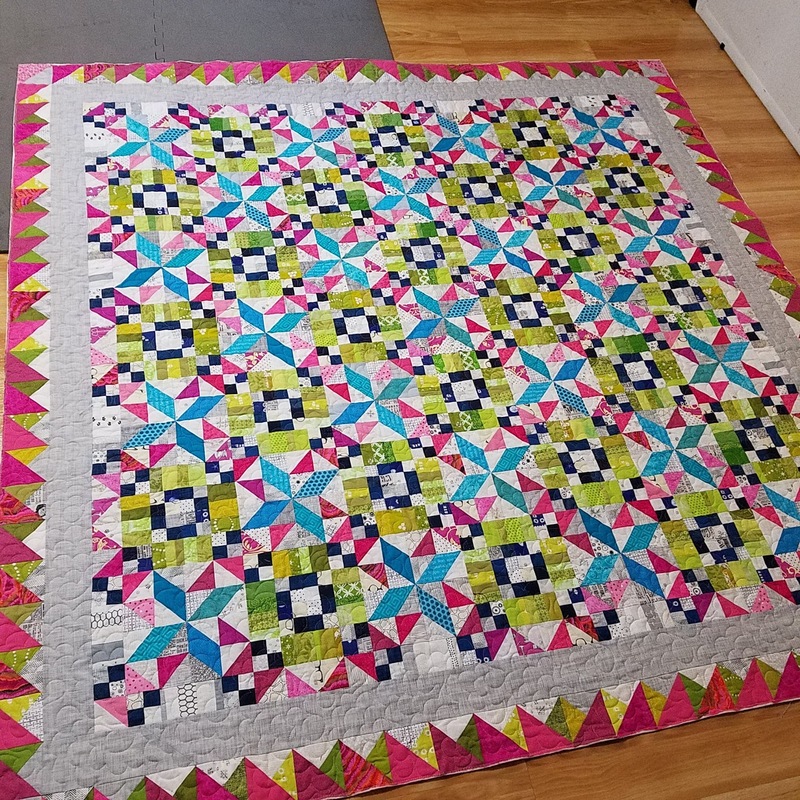 I'm super happy with the Mystery Quilt. Linking up with Bonnie Hunter's Mystery Monday Link Up. 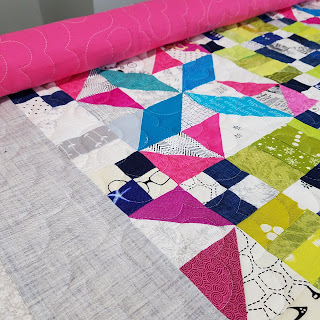 Totally go see what other people are making on the Quiltville Blog! Just absolutely gorgeous and I love what you changed on your border to have the pink triangles on the outside. I might have to copy that once I'm finally able to get back to my quilt. Excited to see what color you choose to bind this one. 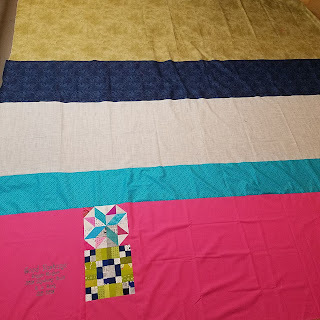 Changing the half-square triangle border and reversing the outside border makes the quilt look very different. I like it all. Beautiful quilt! Your colours are delightful. I love your color combination! Your finished quilt looks wonderful. I love receiving comments and will attempt to reply to questions as I am able. I reply to comments exclusively through email. If you do not change your settings in Blogger to ensure you are not a no-reply blogger I cannot and will not respond to your comment. How many quilts have you made this year? In general, if you see something linked here it is because I read or listen to that site or purchase from those vendors, or have purchased those products. I am a participant in the Amazon Services LLC Associates Program, an affiliate advertising program designed to provide a means for me to earn fees by linking to Amazon.com and affiliated sites. I do this to promote books, tools, and other products that I use to create my projects, and to keep intrusive ads off the blog. Check out these other quilty blogs! I've been thinking about how I want to use the side bar and I think it is time for a change. These blogs are run by some pretty amazing people. Check them out, leave them a note, tell them how much you like what they do. I always have some project in the works. Everything from home improvement, to knitting and sewing. Often my time is limited, so I'm forced to do small projects, other times I have to break down bigger projects to make them fit into my schedule. They have to fit into my schedule that is filled with all the regular things we all have to do in life. Life, being what it is, also keeps me from these projects. Don't be surprised to find long periods of time with no posts, that's just life keeping me from posting. It rarely means I'm not working on a project. I work full-time in a government job. I use my free time to create all sorts of wonderful things. All photos are my own unless otherwise indicated. You may not use my images without my permission. Picture Window theme. Powered by Blogger.